Rachael Campbell competes in the shot put for Miami Trace during the season-opening track and field meet against Wilmington and Clinton-Massie Tuesday, March 27, 2018. Jake Atwood (right) exits the track after handing the baton to Simon DeBruin during the 4 x 800-meter relay at Miami Trace High School Tuesday, March 27, 2018. Along with Caleb Brannigan and Jotham Lewis, the Panthers placed second in the event. 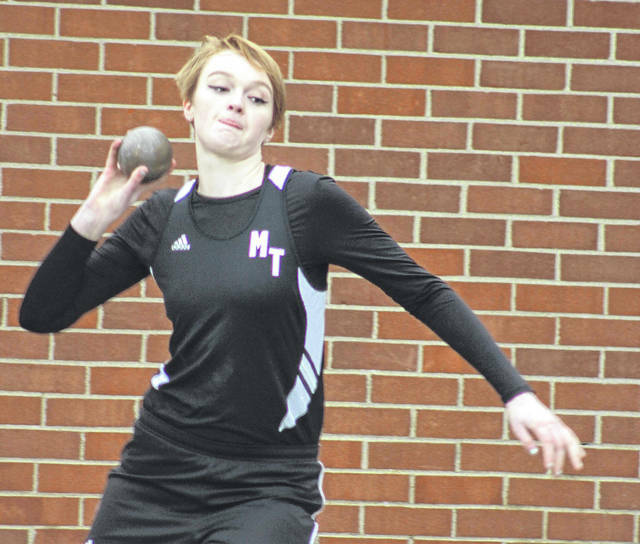 The Miami Trace Panthers opened the 2018 track and field season hosting a tri-match featuring two former SCOL opponents, Wilmington and Clinton-Massie, Tuesday, March 27. Wilmington won a close girls’ competition with 57.5 points. Clinton-Massie was second with 55.5 points and Miami Trace scored 50 points. In the boys’ meet, Clinton-Massie won with 65 team points. Wilmington scored 61 points and the Panthers had 49 points. 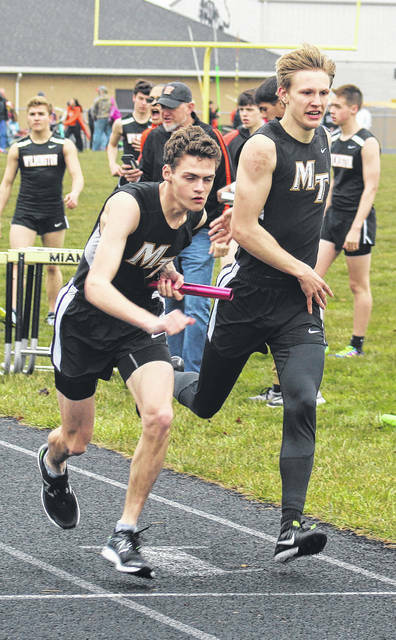 “I thought we came out and saw some positive things from both the boys and girls track and field teams (Tuesday),” Miami Trace head coach Brent Noes said. “We try to come out and have a little fun in this first meet of the year where we let athletes pick and choose many of their events. For the Lady Panthers, there were seven first place finishes recorded. Macy Creamer won the 100-meter dash in 13.7. Creamer also won the long jump with a leap of 14’ 9 1/2”. Katie Seyfang won both throwing events for Miami Trace. She threw 37’ 1” to win the shot put and 111’ 2” to capture the discus throw. Sayler Preston won the pole vault at 7’ 6”. Magarah Bloom won the 1600-meter run in 5:42. Creamer, along with Isabella Vanover, Tori Morrison and Olivia Flerchinger, took first in the 4 x 100-meter relay in 55.4. On the boys’ side, the Panthers won the 4 x 100-meter relay in a time of 45.9. That relay was comprised of Malik Jackson, Keegan Terry, Brady Wallace and Noah Wiseman. Jotham Lewis won the 800-meter run in 2:08. Simon DeBruin won the 3200-meter run in 11:11. He won the shot put with a throw of 50’ 2” and the discus throw with a distance of 139’ 8”. Miami Trace’s next track and field competition is set for Friday, April 6 at the Waynesville Invitational.